Strong Kirchheimer chest bumps his doubles partner. Kirchheimer had a solid performance on Sunday, winning all of his singles and doubles matches. Northwestern faced a difficult task Sunday with a road-home doubleheader, but the team was up to the challenge. The Wildcats won 4-0 at Louisville on Sunday morning before flying back home to defeat Chicago State 4-0 in Evanston later that night. The Cats were led by junior Strong Kirchheimer and senior Fedor Baev, both of whom played four matches that day. The duo won both matches they played as doubles partners, including a victory over Louisville’s top doubles team that helped the Cats win overall doubles at Louisville. 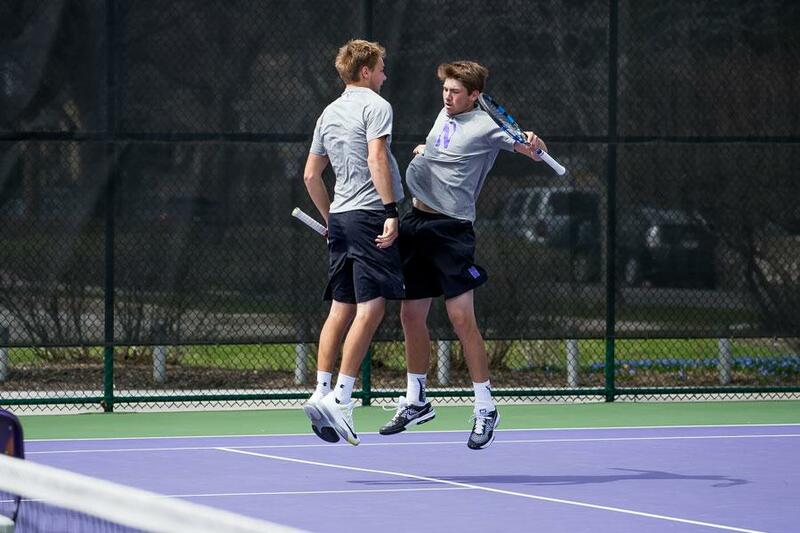 Kirchheimer, junior Sam Shropshire and freshman Ben Vandixhorn all won their singles matches at Louisville, propelling Northwestern to its shutout victory over the No. 36 Cardinals. The Wildcats were similarly successful later in the day against Chicago State, sweeping the match 4-0. Chicago State fielded only five players, forcing the team to forfeit a singles and a doubles match. Vandixhorn and Baev both won their singles matches 6-1, 6-2 against the Cougars, and Baev and Kirchheimer won their second doubles match of the day 6-2 over Chicago State’s Gonzalo Martinez and Felix Savard. Coach Swan changed the lineup from the first to the second match, putting in freshman Michael Lorenzini for his first college singles game against Martinez. Martinez led the match 6-5 in the first set when it was called. Lorenzini admitted to feeling a bit flat-footed to open the match, but refused to use that as an excuse for his slow start. While Lorenzini was playing only his first singles set, Baev was on the next court finishing up his fifth singles set and seventh total set of the day. Despite running the gauntlet for the Cats on Sunday, Baev said he had enough energy left to compete even more. “I could play seven more if I have to,” Baev said following the Chicago State match. Baev completed three of his four matches, winning both doubles sets he played with Kirchheimer, in addition to his singles match over Chicago State’s Rohan Wattley. In his singles match earlier in the day against Louisville’s Brandon Lancaster, Baev led 2-6, 6-1, 4-1 when the match was called.